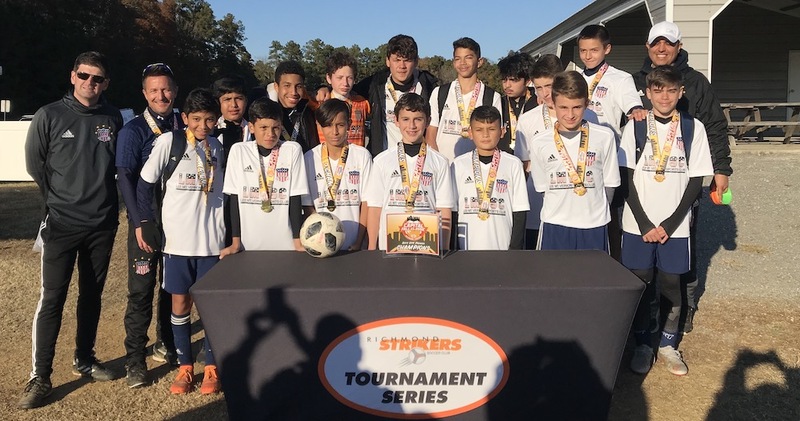 Henrico, Va. – The LMVSC Patriots edged out a five-goal thriller with Waldorf SC to claim the Capital Fall Classic U-14 Premier Division title and gain direct qualification to the Jefferson Cup. The Northern Virginia side jumped out to a two-goal lead within the first ten minutes. Waldorf conjured up the perfect response, however, pulling a goal back less than a minute after conceding the second to let LMVSC know that it wasn’t going to be a cake-walk. What ensued was a back and forth affair in which both teams took turns attacking. Yet, for all their enterprise going forward, the final came down to corner-kicks. Waldorf equalized mid-way through the second-half with an olympico (a goal scored directly from a corner) to complete its come-back in stunning fashion. From there, it was impossible to tell who was more likely to grab a winner, but LMVSC retook the lead late-on. Left-back Tony Chavez swept home the tournament-clincher through a mass of bodies following a goal-mouth scramble that resulted from a corner-kick. At the final whistle, however, there were no scenes of jubilation from the Patriot players. Throughout the match, LMVSC’s conviction to build out of the back was as inspiring as it was refreshing. Yet, Waldorf SC deserves huge credit for its high-pressure. The southern Maryland side forced its possession-based opponents into a more direct, up and down match, leaving them as exhausted as they may have been frustrated. But good teams find ways to win and Pepe Maldonado was ecstatic that his side claimed the trophy that carries with it the coveted prize of automatic qualification to Richmond’s prestigious showcase tournament. Maldonado, a former professional player with Real Maryland in the old USL-2 (United Soccer Leagues second division) knows about the grind of playing on little rest. He was proud of the character his team showed, justifying their subdued celebrations at the final whistle. Perhaps LMVFC didn’t win playing its desired brand of soccer, but Maldonado wasn’t going to let it spoil the victory, its massive implications and an overall enjoyable weekend.